Wilder Red - Large clusters of dark red, medium-sized berries. Fruit is of very good quality. Heavy bearing, vigorous, tall stemmed plant will grow 4'-6' tall and 2'-5' wide. Wilder is a good variety for market or home use. Wilder has a long fruit bearing season, from July 1st to 20th. Pixwell - Medium-sized, oval shaped fruit. Pale green color becoming pink when fully ripe. 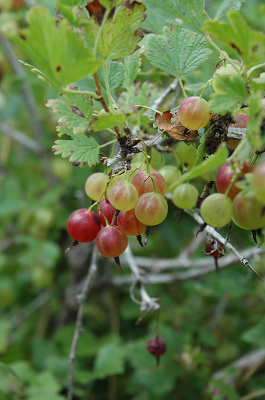 The fruit is born in clusters on long pedicels, making picking easier, hence its name. It has few thorns but are stout and aggressive. Pixwell is too tart for fresh eating, but make wonderful pies, jams and preserves. Leaves turn purple in the fall. This variety is mildew resistant. Overall height is 4'-6' tall. Very productive plants ​(image). 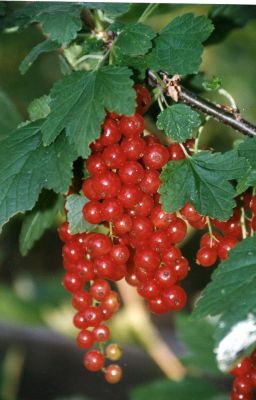 Oregon Champ - Medium to large, yellowish-green berries. Flavor will sweeten as it ripens. Oregon Champ is excellent for pies, jams, canning, and wine. Productive, vigorous plant will grow 3'-5' tall. Berries hold well on the bush. Oregon Champ will start bearing in its second year and produce for approximately 20 years.